The Microsoft Registry Editor enables you to view, search for, and change settings in your system registry, which contains information about how your computer runs. Windows stores its configuration information in a database called the registry which can be accessed using Regedit.exe(Registry Editor). The registry contains profiles for each user of the computer and information about system hardware, installed programs, and property settings. Windows continually references this information during its operation. 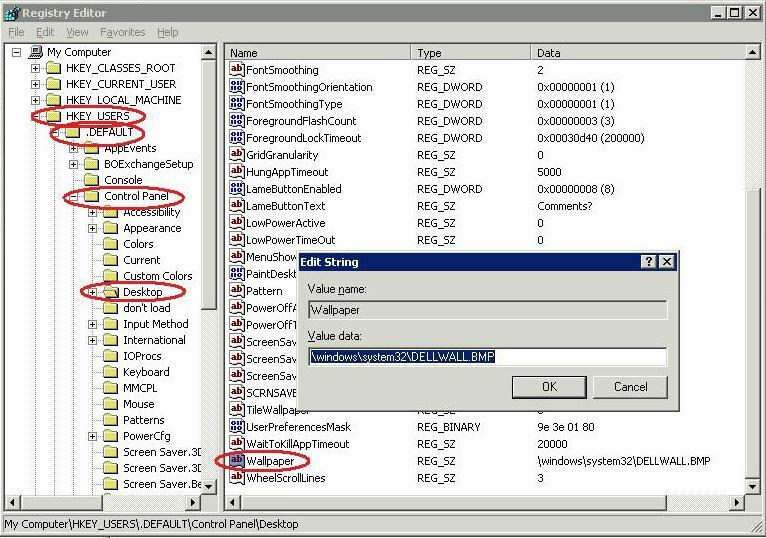 Although you can use Registry Editor to inspect and modify the registry, doing so is not recommended, as making incorrect changes can damage your system. The registry tree is divided into six broad sections (five in NT). HKEY_CLASSES_ROOT HKEY_CURRENT_USER HKEY_LOCAL_MACHINE HKEY_USERS HKEY_CURRENT_CONFIG HKEY_DYN_DATA Folders represent keys in the registry and are shown in the navigation area on the left side of the Registry Editor window. On the left side below My Computer their are five keys HKEY_CLASSES_ROOT, HKEY_CURRENT_USER, HKEY_LOCAL_MACHINE, HKEY_USERS, HKEY_CURRENT_CONFIG, HKEY_DYN_DATA. On expanding these Keys we’ll get the sub keys. In the right side area, the entries in a particular sub key are displayed, which are Name(Contains name of the value), Type(contains type of the value), and Data(Contains associated data of the value. )When you double-click a entry, it opens an editing dialog box. At the status bar of regedit path is shown. The navigation area of the Registry Editor displays folders, each of which represents a predefined key (a key that represents one of the main division of the registry for eg: HKEY_LOCAL_MACHINE ) on the local computer. When accessing the registry of a remote computer, only two predefined keys, HKEY_USERS and HKEY_LOCAL_MACHINE, appear. HKEY_CURRENT_USER Contains the root of the configuration information for the user who is currently logged on. The user’s folders, screen colors, and Control Panel settings are stored here. This information is referred to as a user’s profile. HKEY_USERS Contains the root of all user profiles on the computer. HKEY_CURRENT_USER is a subkey of HKEY_USERS. HKEY_LOCAL_MACHINE Contains configuration information particular to the computer (for any user). HKEY_CLASSES_ROOT Is a subkey of HKEY_LOCAL_MACHINE\Software. The information stored here ensures that the correct program opens when you open a file by using Windows Explorer. HKEY_CURRENT_CONFIG Contains information about the hardware profile used by the local computer at system startup. The following table lists the data types currently defined and used by the system. REG_BINARY Raw binary data. Most hardware component information is stored as binary data and is displayed in Registry Editor in hexadecimal format. REG_DWORD Data represented by a number that is 4 bytes long. Many parameters for device drivers and services are this type and are displayed in Registry Editor in binary, hexadecimal, or decimal format. REG_EXPAND_SZ A variable-length data string. This data type includes variables that are resolved when a program or service uses the data. REG_MULTI_SZ A multiple string. Values that contain lists or multiple values in a form that people can read are usually this type. Entries are separated by spaces, commas, or other marks. REG_SZ A fixed-length text string. REG_FULL_RESOURCE_DESCRIPTOR A series of nested arrays designed to store a resource list for a hardware component or driver. You must back up your registry before tweaking into it or it may lead you to reinstall your operating system. You can search for lot of registry backup tool an use any one of them, like ERUNT or click here for alternate methods of backing up registry. Microsoft Help and Support center.